HTML5 is the next-generation of web standard mark-up language, and among other things, it offers amazing new avenues for incorporating multimedia into your sites. What easier way to master all of HTML5's new bells and whistles than with a guide that shows you, screenshot by screenshot, just what to do? Over a hundred tasks that web designers need to know most are explained using, full-color screenshots and how-to steps. From the easy stuff like revised new header and footer elements to complex updates such as canvas and audio, this guide covers the new, as well as most-commonly used, tags and features. Web designers, keep your HTML skills up to date with this "learn-by-seeing," visual guide. Chapter 1 Getting Started with HTML5 and Web Pages. 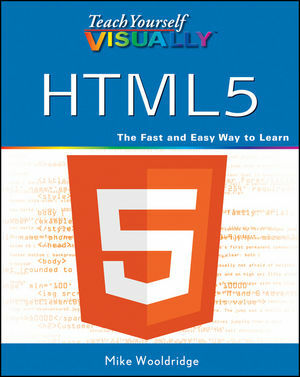 Chapter 2 Creating Your First HTML5 Web Page. Chapter 3 Adding and Modifying Text. Chapter 4 Adding CSS Styles. Chapter 8 Working with Tables. Chapter 10 Controlling Page Layout. Chapter 11 Adding Semantic Tags. Chapter 14 Adding Video and Audio. Chapter 15 Publishing Your Web Pages.